Creating With Joan: Stampin' Up! Memories and More with Colorful Seasons makes a perfect match in the 2017/2018 Annual Catalog! Stampin' Up! Memories and More with Colorful Seasons makes a perfect match in the 2017/2018 Annual Catalog! Enjoy Colorful Seasons All Year Long with Memories and More! So much fun creating with the Color Theory Suite! This DOstamperSTARS Create and Play inspired the opportunity for these fast and easy designs to be used all year around! The versatility is amazing for Scrapbooking Memories and Card Making! This suite has it all! Stampin' Up! Colorful Seasons Photopolymer Stamp Set and Seasonal Layers Thinlits Dies Bundle #145346, Color Theory Designer Series Paper Pack #144193, Color Theory Memories and More Card Pack #144210, and Color Theory Cardstock Pack #144194. 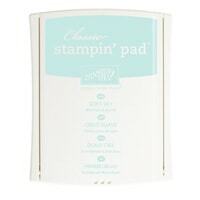 Visit my online store for these fantastic products! 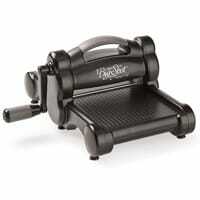 and SHOP NOW for these great products and more! So, let's get started with the fun! 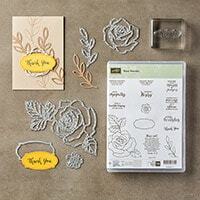 Products used along with the Color Theory Suite: Rose Wonder Stamp Set #140697 and Best Birds Stamp Set #141525 for sentiment tags and messages. Tempting Turquoise Cardstock #102067, Soft Suede #115318, Basic Black #121045, and Whisper White Cardstock #100730. Berry Burst Ink #144243, Old Olive #126953, Dapper Denim #141394, Crushed Curry #131173, Tempting Turquoise #126952, Blushing Bride #131172, Soft Suede #126978, and Sahara Sand Ink #126976. 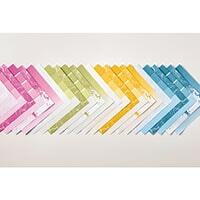 Enjoy the four seasons of the Color Theory Suite with your next scrapbooking or card making project. 1) Cut two Tempting Turquoise Cardstock #102067 5 1/2 x 4 and one 4 1/4 x 3, Color Theory Designer Series Paper Pack #144193 5 1/4 x 3 3/4, and Whisper White Cardstock #100730. 2) Cut Whisper White Cardstock #100730 for sentiment tag. Stamp sentiment with Colorful Seasons Photopolymer Stamp Set #143726. Adhere card image and mat tag with Color Theory Memories and More Card Pack #144210. 3) Stamp inside of card with Colorful Seasons Photopolymer Stamp Set #143726 and Rose Wonder Stamp Set #140697. 1) Cut two Dapper Denim Cardstock #141394 5 1/2 x 4, one Whisper White Cardstock #100730 5 1/4 x 3 3/4, cut image and mat with Color Theory Memories & More Card Pack #144210. 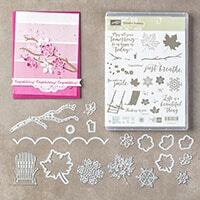 2) Die cut snow flakes with Seasonal Layers Thinlits Dies #143751. 3) Stamp inside of card with Colorful Seasons Photopolymer Stamp Set #143726. 1) Cut two Basic Black Cardstock #121045 5 1/2 x 4 and one 4 x 1, one Whisper White Cardstock #100730 5 1/4 x 3 3/4. 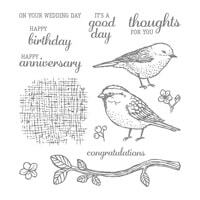 2) Cut sentiment tag and stamp with Best Birds Stamp Set #141525. 1) Cut two Soft Suede Cardstock #126978 5 1/2 x 4 and one 4 1/4 x 3, one Whisper White Cardstock #100730. 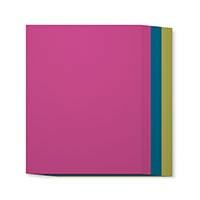 Mat Color Theory Memories & More Card Pack #144210 and cut image 3 3/4 x 2 3/4. 2) Stamp and die cut sentiment tag with Rose Wonder Stamp Set #140697. 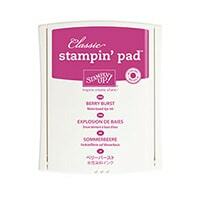 3) Stamp sentiment on inside of card with Rose Wonder Stamp Set #140697. 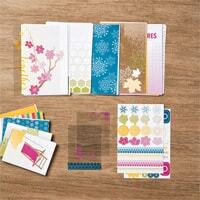 'Step it up' for Spring and Fall with Colorful Seasons Bundle #145348. Die cut and stamp images with Colorful Seasons Bundle #145348 to cover printed leaves and flowers for added dimension.